HyperCaster users will find some welcome enhancements to the live broadcast workflow in the software version 6.2, released today. Create a “Join-in-Progress” Overlay announcement that automatically runs when you end an extended live event and rejoin the scheduled programming. Includes the ability to squeezeback video during the Join-in-Progress overlay and fully customize the graphics branding. The Record tab is now fully responsive and mobile-friendly, making it easier to control a record event remotely, from a cellphone. In addition, the HyperCaster v6.2 allows you to play and record YouTube Live sources. Simply add it to your available feed list, and then switch to or schedule the YouTube Live source as you would any other event. The HyperCaster 6.2 release also provides the ability to schedule playlists to air at specific times, in addition to using playlists as automatic, continuity filler. Please refer to the release notes for a complete list of the HyperCaster v6.2 features. The TelVue HyperCaster imports virtually any video format, enables remote drag-and-drop scheduling from any browser, supports closed captioning, and allows the user to switch & record live video streams right in the web browser user interface. 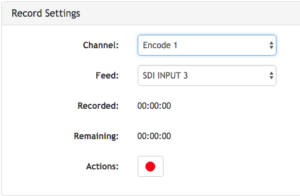 Powerful, available workflow options include 1-click publishing for streaming/OTT, archive & retrieval to Networked Attached Storage and Archive.org, auto-fetching content and metadata from cloud-contributed and Media Exchange programming, native HD/SD Simulcast, and real-time CALM channel audio loudness management.